Swopping magpie: A common sight during spring as the birds patrol territory to protect their young. SPRING has sprung and so have magpies who swoop cyclists, joggers and walkers at this time of year in the mistaken belief people pose a danger to their newly born nesting offspring. Most magpie attacks are harmless apart from the shock some may feel when being swooped by the overly protective birds but some attacks cause serious injuries, especially to young children who are a vulnerable target of magpies’ ire. Those seeking to avoid any confrontation with magpies can now consult a website called Magpie Alert to see whether there have been any avian attacks in their neighbourhood. Sydney-based web designer Jon Clark says he had the idea to develop the site after he was swooped by an aggressive magpie while cycling in his hometown suburb of Bella Vista. “I got swooped while I was out on my bike and I had a look for information online and there were little bits here and there and a few little maps but nothing near where I lived,” he said. People can log magpie attacks and send the information to the Magpie Alert site. In this way attack ‘hot spots’ are identified if repeat attacks are logged by several victims. Mr Clark said about 150 attacks per day are logged with Magpie Alert at this time of year and he reads every single one to ensure they’re the real deal before the information is posted online. Any bad language about magpies at such an emotive time for the attacked is moderated by Mr Clark before comments are uploaded making the site family-friendly. 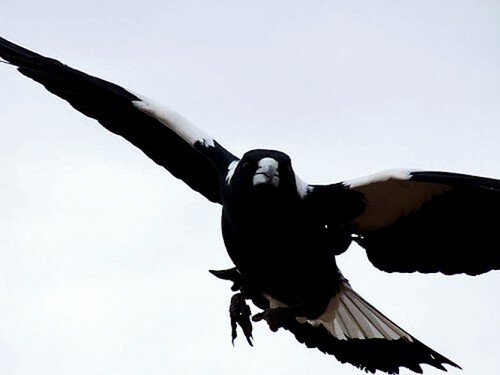 The Magpie Alert shows there have been magpie attacks that caused injury in Mornington, Mt Eliza, Mt Martha, Somerville and Crib Point this year. There have also been attacks along the Peninsula Link trail in Frankston. Mr Clark said statistics collated by his site showed there have been 600 injuries nationwide this spring, accounting for about 14 per cent of overall attacks. The web guru has put together the Magpie Alert site in his own spare time and a recent redesign has seen online traffic soar with the use of Google Maps to illustrate where attacks occur and the ability to log in to the site using Facebook and Twitter to spread messages about attack sites. Mr Clark said he may design an app for smartphones and the Apple Watch in future but “it depends how much time I get”. See magpiealert.com to view magpie attack details. The site is free to view and use. Those who find the site useful can buy the designer “a beer or two” via a voluntary donation section on the site.